Each month the first section will be filled with fantastic stand up comedy talent hosted by our brilliant MC Chris Lumb (as seen on Russell Howard's Good News). 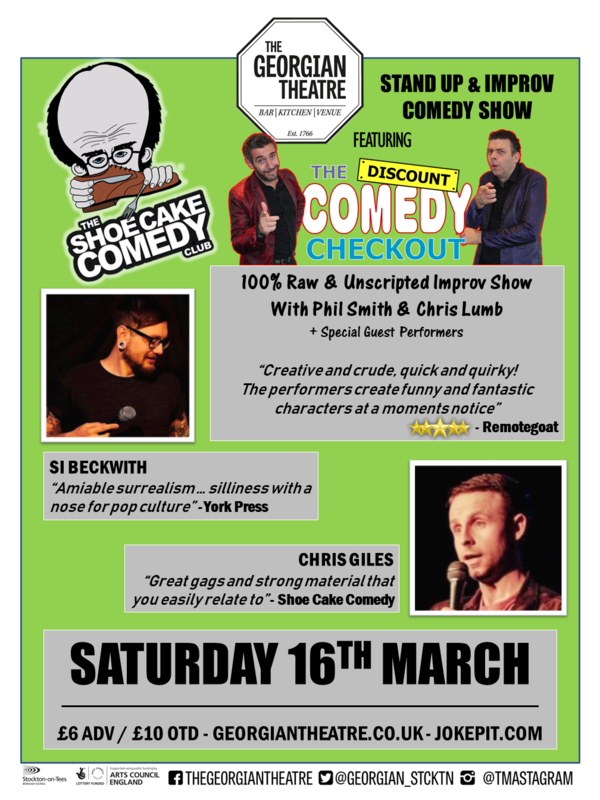 The Discount Comedy Checkout - Plus occasional guest performers. If you've never seen improv before, you are in for a right treat. All the games, scenarios, and situations are formed from your suggestions ... thats right YOU, the audience. Its brilliant, great fun, and hillarious! You can also pick up advance tickets direct from the Georgian Theatre Box Office. Why not pop down early and take full advantage of the fantastic bar offerings. Discounted online ticket and guarantees admission - LIMITED on the door tickets for £10 No paper tickets will be issued for this event. Bring along your confirmation email. NB: A small transaction fee of 10% is included in each ticket sale.